May | 2015 | Namaste to you, Sir! This weekend I walked from Richmond, through Richmond Park all the way to Wimbledon. It was a lovely day, though a bit cloudy, and the park was full of people enjoying some fresh air. By the time I got home, some 5 hours later, I was famished. Earlier in the week I had found that Holland and Barret were stocking some dried apricots which were sulphites-free. Dried apricots, pineapple and mango usually have added sulphites which keep them looking close to their original colour, but are not so good for us. Organic, sulphites-free apricots look dark brown, but they taste just as nice. You can see them on the photo below, chopped (sorry I didn’t think about taking a photo of them before chopping and throwing them in with the rest of the stuff). 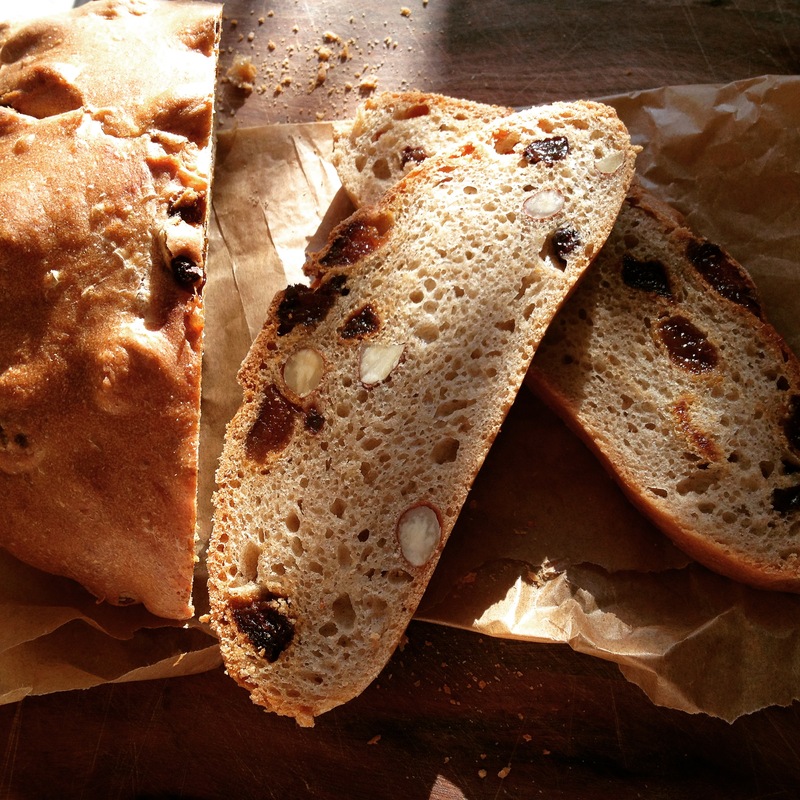 Those lovely apricots were my inspiration to make this spelt, apricot and almonds bread as soon as I got home. It worked really well with cheese, and also the following morning toasted and lightly smeared with salty butter. It is super easy to make, so give it a go! 50 g dried apricots, chopped. 1.- Mix the yeast with a bit of the luke warm water (approx. 3 tablespoons). Let it rest until it begins to froth. 2.- In a large bowl mix together the flour and the salt. 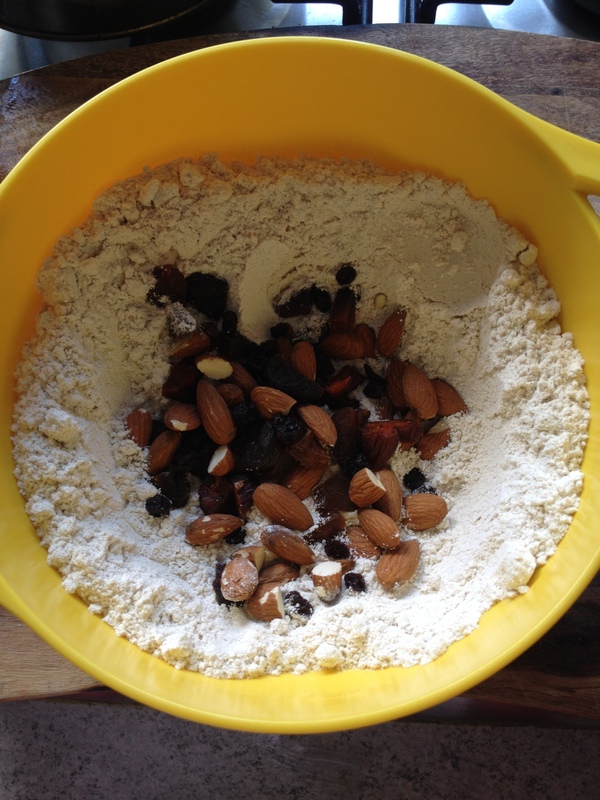 Then add the chopped apricots, the almonds and raisins, mix until they are covered in the flour. Make a well in the middle. 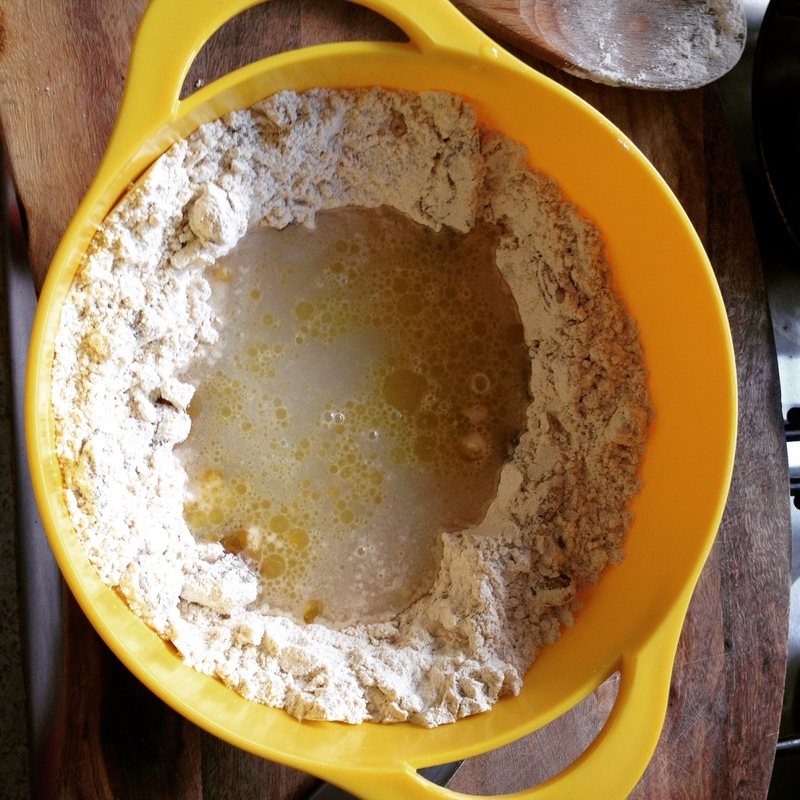 3.- Once the yeast is frothy, add into the centre of the well, together with the oil and the remaining water. If the mixture is too dry, add a bit more water. You will find, in general, that spelt doughs require less water and proofing time than regular doughs. They are also quite sticky and never as silky as white flour mixtures. 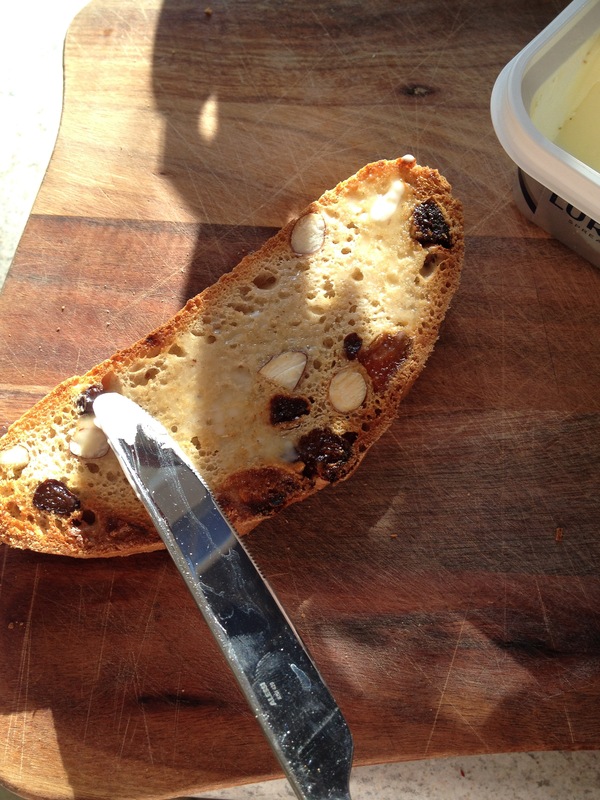 4.- Use a wooden spoon or bowl scraper to shape the dough which will be a bit sloppy. Spelt flour is a little lower in gluten than wheat flour, and its gluten strands are shorter, therefore kneading too much can break the delicate gluten structure which will result in a tough or flat bread. One way to gently “knead” the dough is the following: Pour it out on a flour covered surface. Then dust the dough with a bit of flour (if it is too sticky to handle) and fold it 4 times. Take the first side and fold it onto the middle of the dough. Repeat this for the opposing side, then do the same thing to the top and bottom. Repeat 1 more time. 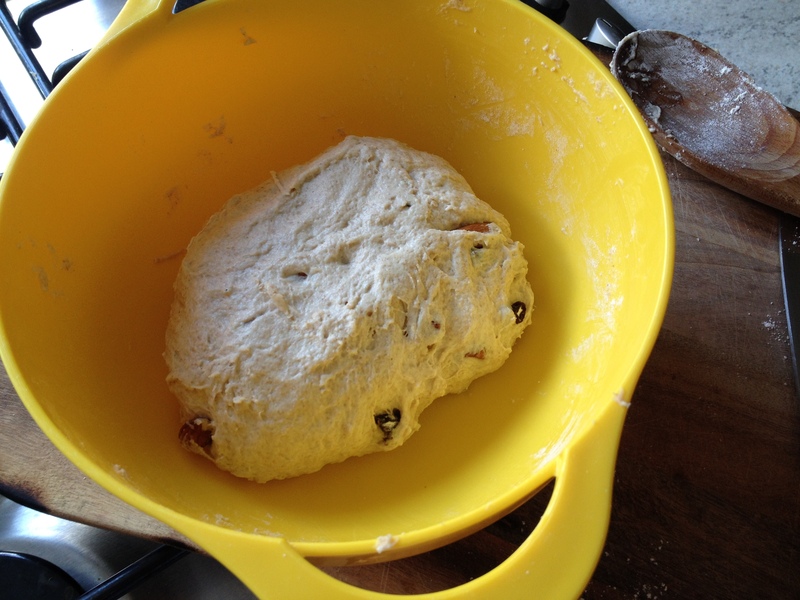 5.- Leave the dough in a bowl covered with film or a plastic bag to double in size. 6.- When the dough is ready, turn it out onto a floured surface. Degas and flatten. 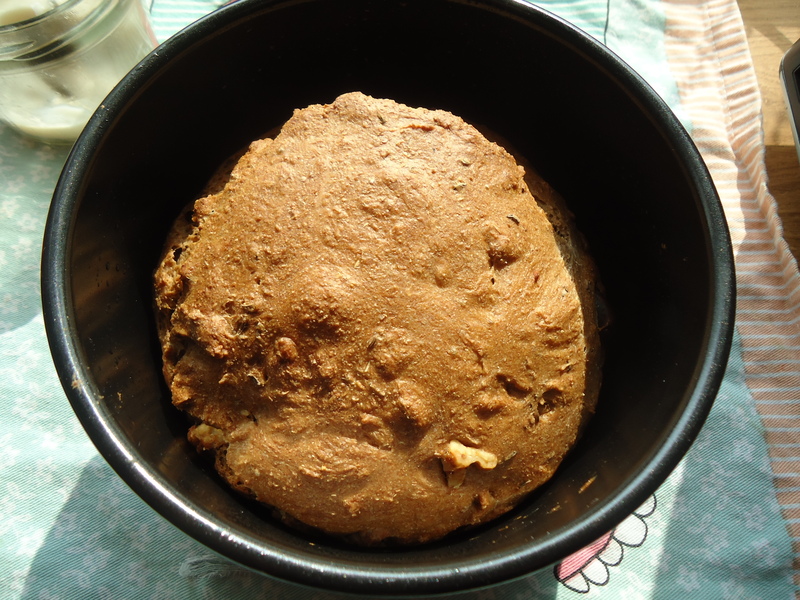 7.- You can then put the dough into an oiled 1/2 kg bread tin or on an oiled baking tray. At home I have a baking stone so I used that. Bear in mind, if you don’t use a baking tin that spelt breads tend to spread to the sides rather than rise, so a bread tin will help it keep its shape more than a tray. 8.- Leave to rise for just 30 minutes, then place in a preheated oven at 180 C for 45-45 minutes. It will come out golden and with a lovely crust. 9.- To make sure it’s fully baked tap the bottom of the bread, if it sounds hollow, it’s ready 🙂 Don’t forget to try at least one slice toasted with butter, the combination of sweet bits, crunchy crust and salty butter is amazing! This recipe is so incredibly easy I can’t believe I didn’t post it before. It makes cookies which are crunchy on the outside but have a soft middle, and they keep well for a couple of days (if they last that long) in an air-tight container. 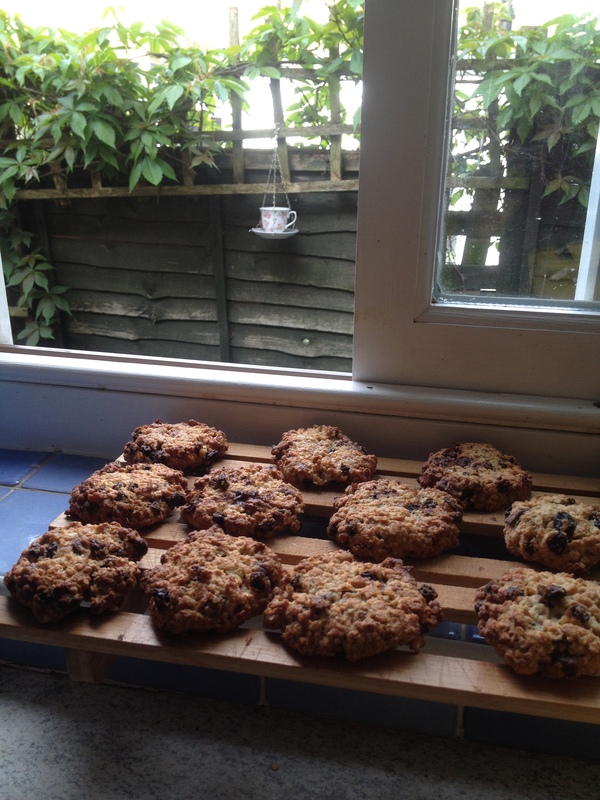 150g in total of raisins, chocolate chips and pecan nuts. I used 50g each, but you can vary the quantities and of course use different nuts or fruits. 1.- Preheat the oven at 180 C degrees. 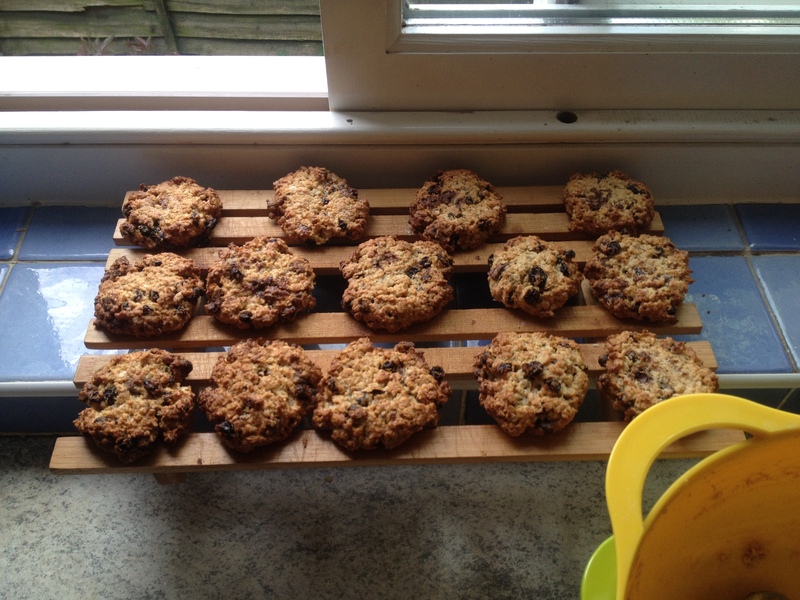 2.- Line a baking tray with baking paper. 3.- In a bowl beat the butter and sugar together until they are light and fluffy. 4.- Add the vanilla essence and the egg. Whisk everything together. 5.- In a different bowl mix the flour, oats, salt and baking powder. Then add the raisins, chocolate chips and pecans. Mix together. 6.- Add the dry ingredients to your wet ingredients and mix with a wooden spoon. You should have a mixture that can be shaped into small balls. If it is too dry add some milk, a tablespoon at a time until you get the right consistency. 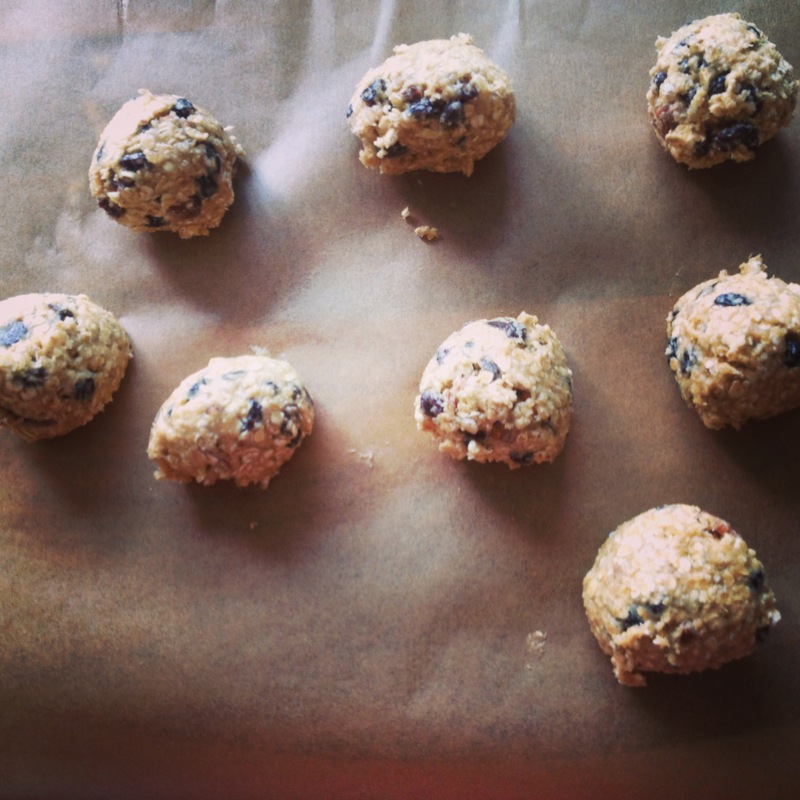 7.- Shape the dough into balls, which should be just a bit smaller than a golf ball, and place in the baking tray. Use the back of a spoon to flatten them a bit. 8.- Place in the oven and bake for 15-20 minutes, until golden.